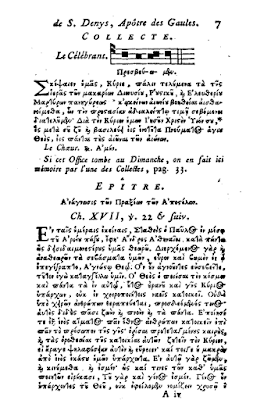 Through most of the Middle Ages, knowledge of the Greek language was extremely limited in Western Europe. It is well-known, for example, that St Thomas Aquinas frequently cites the writings of Aristotle, but only knew them in the Latin translation of his friend William of Moerbecke. 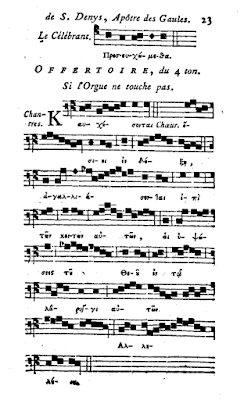 Nevertheless, from time to time we see evidence of interest in Greek in various types of liturgical texts, such as a number of medieval hymns with Greek words in them. 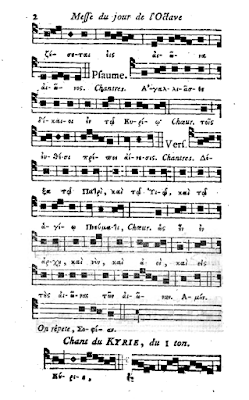 One stanza of the Vesper hymn for Advent Conditor alme siderum originally began with the words “Te deprecamur, Agie – we beseech Thee, holy one”, a reading which may still be found to this day in the Uses of the monks and religious orders. 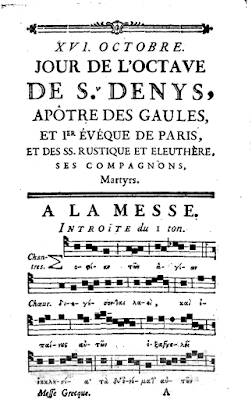 Sometime in the 12th-century, the monks of the Abbey of St Denys outside Paris, a major center of learning, developed enough interest in Greek that they instituted the custom of singing the entire Mass on the Octave day of their Patron Saint in that language, a custom which continued until the French Revolution. This was not the Byzantine Divine Liturgy, but the Mass of the Roman Rite translated into Greek. 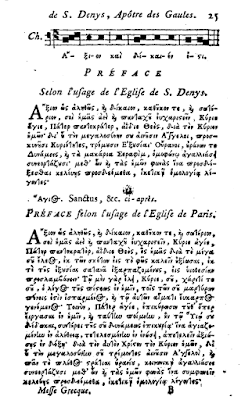 By that period, St Denys was believed to be the same person as “Dionysios the Areopagite”, who is mentioned at the end of Acts 17 as one of the persons converted by St Paul’s discourse to the Athenians. (The name “Denys” derives from “Dionysios.”) The legend continued that he was the first bishop of Athens, who had then gone to Rome and been sent by Pope St Clement I to evangelize Paris, of which city he was also the first bishop, and where he was martyred. 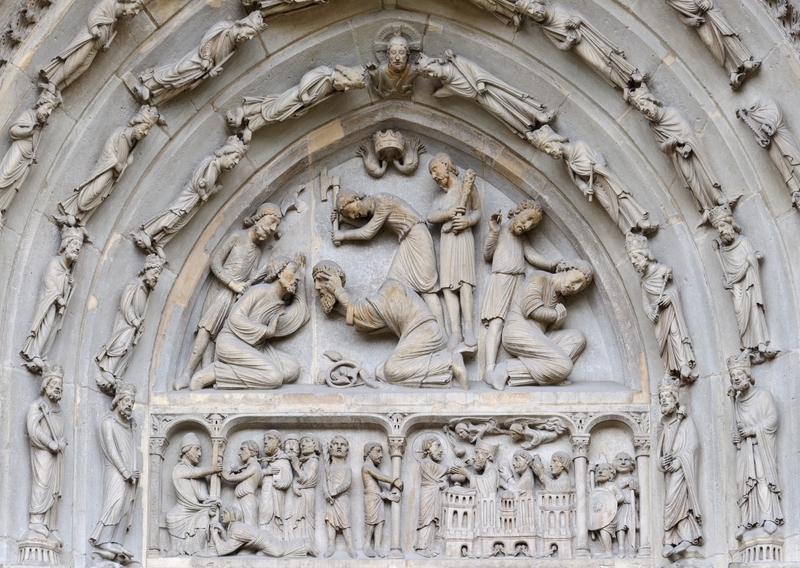 The martyrdom of St Denys, and his companions Rusticus and Eleutherius, depicted in the tympanum of the north portal of the Abbey of St Denys. (12 century - image by Myrabella from Wikimedia Commons.) 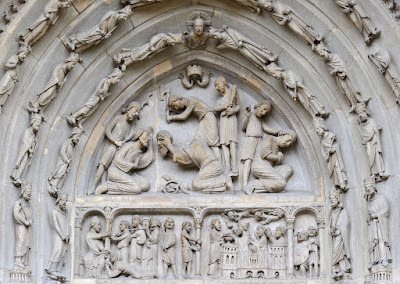 Denys is shown holding his own decapitated head, which his legendary medieval life says he picked up and walked with from Montmartre (“the mount of the martyrs”) to the place which would later become the site of the Abbey. The Greek Mass was certainly instituted to honor the Abbey’s patron not only as an important writer of theology in Greek, but also the first bishop of the most important cultural center of the ancient Greek world. 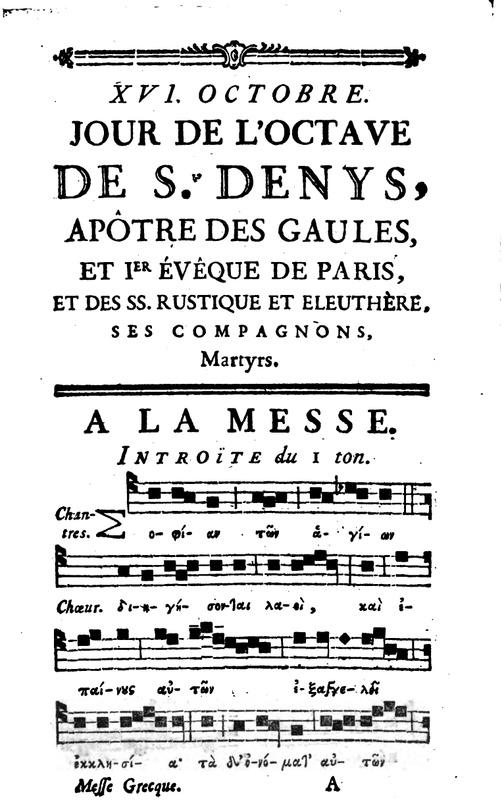 The complete text of the Mass was published at Paris in 1777; it can be found on googlebooks by searching for “Messe grecque en l’honneur de Saint Denys”, but due to who-knows-what mysteries of copyright law, cannot be downloaded in every country. 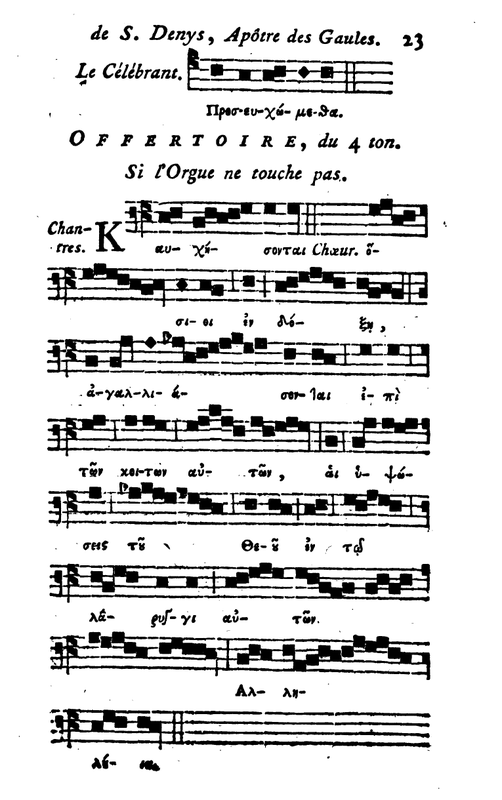 Here are a few pages of it, in honor of his feast day. 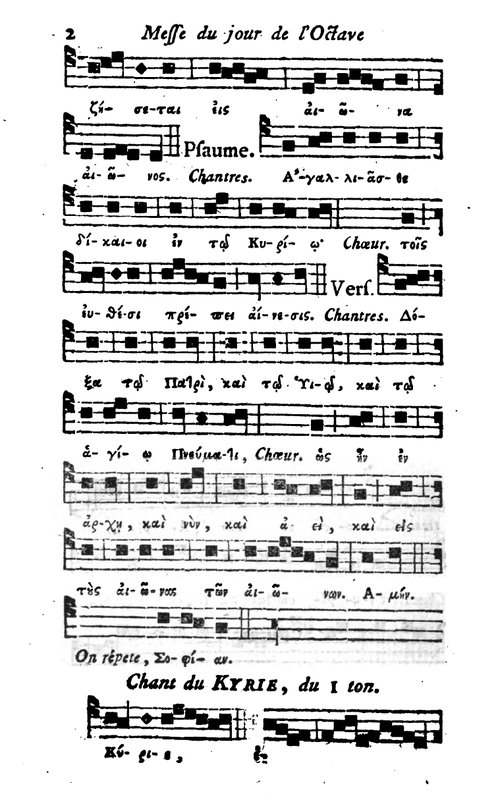 The Gregorian Introit “Sapientiam Sanctorum” from the Common of Several Martyrs (continues on following page). 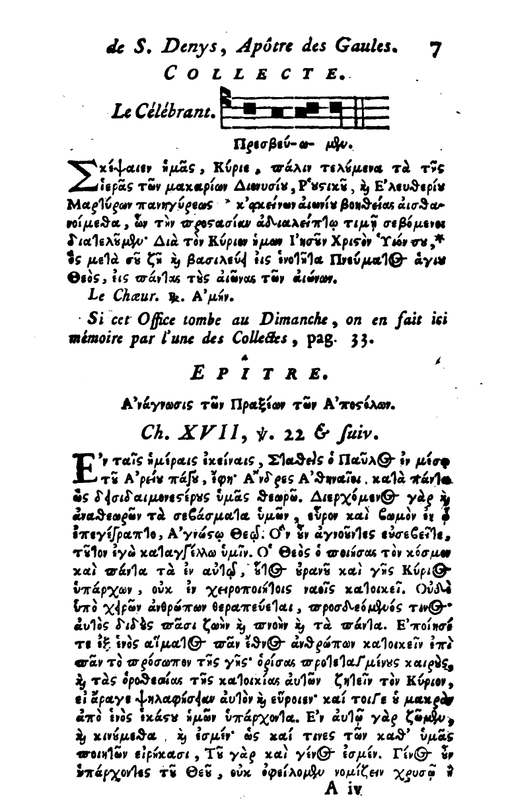 The Greek font used here is different from that used in modern printed editions of classical texts, since it is based on medieval Byzantine handwritten scripts. 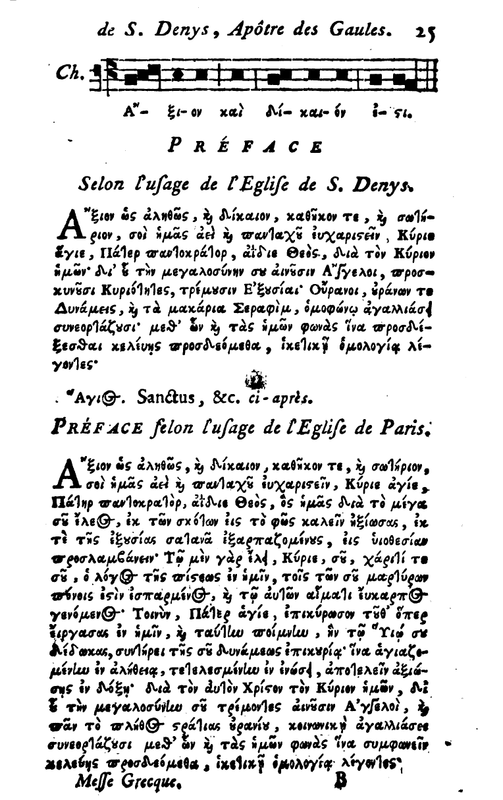 The Roman Common Preface above, and the neo-Gallican proper preface below.